Eva Jackson is the senior marketing manager at Emplify, an Indianapolis-based tech company that provides employee engagement insights to business leaders. 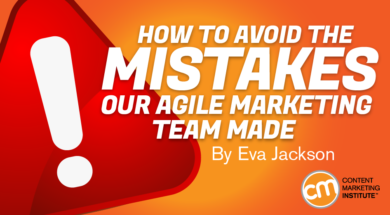 She is also the founder of Agile Marketing Indy, an area networking meetup that encourages conversation around how to integrate Agile into the marketing workflow. When she’s not working to get sh*t done at Emplify, you can find Eva traveling with her husband, Jeffrey, or cuddling with her pets, Beans the dog, and Vinny the cat. Connect with Eva on Twitter @evacjackson. The secret’s out. Agile project management is a game-changer – and developers and IT folks are no longer the only ones to know about it.